A woman in Bellevue has a variety of ailments. 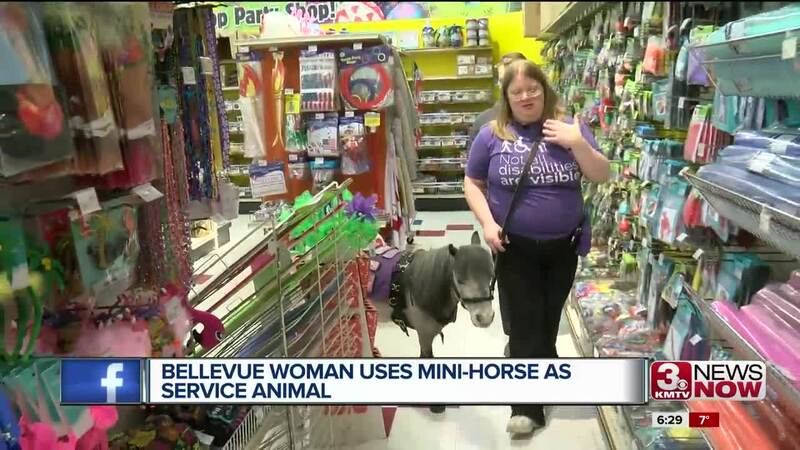 To help with them she uses a mini-horse as a service animal, drawing attention everywhere she goes. BELLEVUE, Neb. (KMTV) — Abrea Hensley takes her mini-horse Flirty everywhere. Whether it be the movies, grocery shopping or even the doctors office. "I was actually just seeing one of my specialists today and without me prompting her she told me I wouldn't be alive without Flirty,” says Hensley. Flirty is Hensley's service mini-horse. She suffers from a variety of ailments including: depression, severe anxiety, panic disorder and PTSD. Walking around Nobbies in Bellevue, she says she could barely go anywhere before she got the horse two years ago. "If I did go grocery shopping, I would end up having to leave halfway through. Sometimes I couldn't even go through checkout, I'd just have to leave my cart in the aisle and go home," says Hensley. The task has to be a physical action. Hensley says Flirty does multiple things for her. The mini-horse will remind her to take her medication, give her stabilization when she gets disoriented around crowds and even alert her when her anxiety builds up. Flirty does wear a vest to alert the public to not pet her and to give them both some space, but sometimes the public doesn't always listen. Some folks will still pet Flirty or yell at her for attention, others react angrily to Hensley, and harass her. "I've even been threatened or cyber-bullied, I had someone offer to buy me a gun to end my problems," says Hensley. She says most businesses accommodate them, but has been kicked out twice so far. Hensley is now considering a lawsuit. "I was treated so poorly and the managers responses when I followed up were poor," says Hensley. "They are going to be hearing from the department of justice and I'm definitely going to be pursuing legal means as well." Hensley believes she's the only one in the area that has a mini-horse as a service animal. She hopes eventually the public just gets use to them. "We understand that our animals, especially service horses are very eye-catching, but we're just there to get our milk and go home,” says Hensley.